2018 is here and what better time for you to get knee deep in learning more amazing photo techniques and tricks. To help you expand on your photography Copytrack introduces pinhole photography, a challenging, but exciting method of photography. It been practiced for over a 100 years with works dating back to 1850s and it’s pretty much what it sounds like. Instead of a lens a pinhole is used to capture dreamy images. To give us a better insight Copytrack spoke to pinhole photographer Moni Smith. How did you first come into contact with pinhole photography and what drew you to it? I had a friend who posted some of his pinhole photography on Flickr about 10 years ago and I was intrigued. The images had a very dreamy quality and I was instantly drawn in. I didn’t give pinhole photography another thought until 5 years ago. By that time, I switched from shooting mostly digital to mostly film and had become friends with a lot of film photographers all over the world, following their blogs, Twitter, and Instagram accounts. A few of my friends were posting pinhole photos and I remembered the ones from 10 years ago. I became interested in learning more so I took a class from Zeb Andrews, a well-known and very talented pinhole photographer here in Portland, Oregon. I’ve been obsessed with pinhole photography ever since. Can you tell us what pinhole photography is and the affect it has on images? A pinhole camera is, essentially, a box with a hole in it. Many people might be familiar with pinhole viewers if they have witnessed a total solar eclipse. A pinhole camera works exactly the same way. A pinhole is made on one side of the box and on the other end is a way to capture the image (film or photographic paper). The pinhole has a very small aperture. Most of my cameras have apertures at around f135. To compensate for the small aperture, one has to have longer exposure times. This aspect is really fun to play around with. For example, in broad daylight you can shoot a scene that would be 5+ seconds and record the movement of a crowd, or the blur of the branches of a tree as the wind blows through it. It’s really fun to set up a shot but not know what exactly you are going to get. Another really interesting thing about smaller apertures is there is a very deep depth of field, so everything in the frame is in focus. What are the greatest advantages to pinhole photography? I love that it is very limiting. The only real technical choice is the kind of film you want to use before you head out to shoot. But once the film is in the camera you are stuck with that choice. There is no fiddling with anything on the scene, nothing to distract from the composition of the shot. So the only thing you are left with is composition. I feel like this makes me more mindful of what I am making an image of. There is something about being limited that causes me to be more creative. Kind of like the way a poet is limited to a form, like a sonnet, or haiku. I also love that it slows me down. Exposure times in places I like to photograph (the forest) can be quite long, but I enjoy that time while I wait. What are your favourite subjects to photograph when it comes pinhole photography? I love photographing crowds because it’s fun to see the blur of the motion of people. I also love to photograph the forest, because that is where I spend a lot of my free time. What are the biggest challenges with pinhole photography? I would say the biggest challenge is that pinhole cameras use film. That can be a challenge if you are used to instant gratification. There is also the cost of buying film and developing it, or time if you want to develop your film at home. Learning how to do these things is a challenge. But it’s a fun challenge and worth it! Also, pinhole photography is very different from digital photography and the results are very different. You have to learn to let go of some control of the process. The results may not be what you expected, so this can be a challenge at first. What advice would you’ve give to someone thinking about starting pinhole photography? Start with a camera that uses medium format film. Medium format is higher resolution than 35mm so your will have nicer looking results. This will help when you are first starting because, as I mentioned, pinhole photography is very different from digital and the results at first might be weird, or weirder than what you are used to. If you start with a camera that uses 35mm film the image quality won’t be as good and you might be frustrated with your results. Same goes with digital. It’s possible to create pinhole photographs with a digital camera using a lens cap. I don’t recommend it because the quality of the image is generally awful. Once you have the camera and are ready to shoot, let go and have fun with it. Let go of expectations and enjoy the process and the unexpected results. What are you currently working on, and do you have any up and coming projects? Currently I am putting together a project where a pinhole camera is passed around the world: The Great International Terrapin Swap. 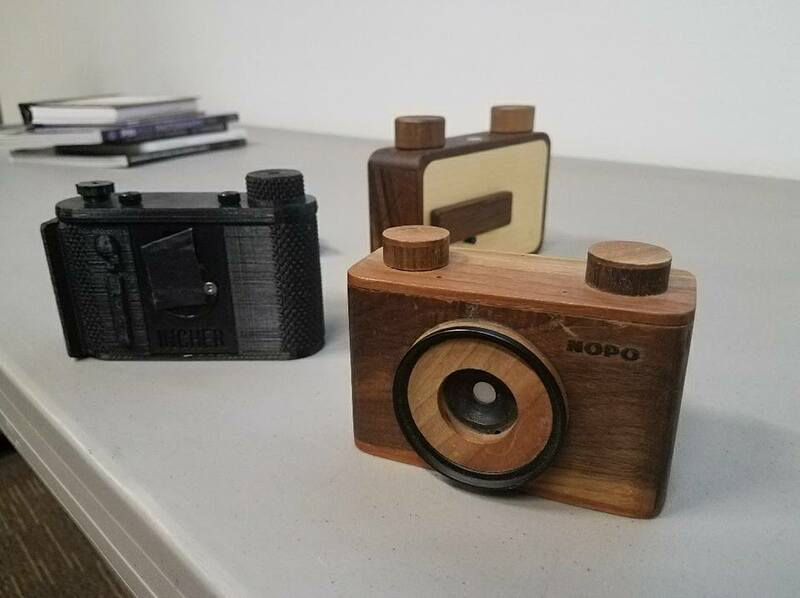 My friend, Todd Schlemmer, 3d prints pinhole cameras and printed one for the project. The camera will go to a person, the person will shoot a roll of film, rewind it to the first frame and then send it on to the next person who will double expose over the roll. Then that person shoots a roll, rewinds and sends on to another person. The results will be posted on the project’s website: Gitswap.org. Learn more about Moni and her work at her website, Flicker, and Instagram.